There are only a few North American members of this genus, and they are relatively easy to separate from the other boletes; they are shaggy to scaly, blackish or grayish mushrooms with partial veils and woolly stems. Their flesh stains pinkish or orangish red when sliced, then slowly turns black. 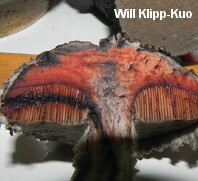 Species of Strobilomyces are mycorrhizal with hardwoods in eastern North America. Many of the reigning concepts in Strobilomyces taxonomy have been recently overturned, and more changes are almost certainly on their way. Petersen and collaborators (2012) studied three European species with reticulate spores: Strobilomyces strobilaceus (first named by Scopoli in 1770), Strobilomyces floccopus (Vahl, 1797), and Strobilomyces strobiliformis (Dickson, 1785). In short, the researchers determined that it was difficult to maintain these three separate European species on the basis of morphology--and, when DNA results were factored in, it became impossible, since specimens identified as all three species turned out to be phylogenetically the same. Thus, according to the rules of taxonomy, the oldest name in the group gets the prize; Petersen and collaborators determined that the European species with reticulate spores should be called Strobilomyces strobilaceus, while Strobilomyces floccopus and Strobilomyces strobiliformis became deprecated synonyms. 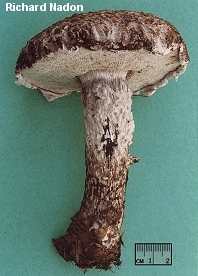 In North America, however, we can't just replace what we have been calling "Strobilomyces floccopus" with the name Strobilomyces strobilaceus, because Petersen and collaborators included North American collections in their study and discovered that they were not a phylogenetic match to the European collections. This means that our North American, reticulate-spored species lacks a name. In fact, further research might easily determine that we have more than one North American species with reticulate spores (Nancy Weber's "Strobilomyces dryophilus," for example, should be studied). All of this means that for the time being identifications of Strobilomyces species on our continent should be seen as tentative; we know there will be new species, but we don't know how many there will be, or whether they will be easily separable without a DNA laboratory. Before DNA studies, Weber (1985) thought that "[a]bout four taxa in the genus Strobilomyces occur" in the southern United States alone (although she only described two and alluded to a third). An extensive study devoted to North American collections is clearly needed. 1. Spores with spines and ridges but never completely reticulate; cap scales usually small, stiff, and pointed. 1. Spores always reticulate; cap scales often larger and softer than above. 2. Cap when young with shades of grayish pink to pinkish tan or pinkish brown; young cap surface hairy to woolly, developing broad, flat scales with maturity. 2. Cap without pink shades; young cap surface with broad scales already formed.